Poblocki Sign Company LLC, a national leader in the custom sign industry, is honored to work with Daniel Hennigan, U.S. Army Retired and Founder and Chairman of South Carolina 9-11 Historical Memorial to create a custom display case to honor the 3,000+ who tragically lost their lives on 9-11 including 343 firefighters. Hennigan also chairs the South Carolina Tunnel 2 Tower Run/Walk. The goal of Tunnel to Towers is to support first responders and military service members who have been catastrophically injured in the line of duty. On September 10, 2010 Marine 1 Fire Boat was renamed 343. Tower 1 and Tower 2 steel was used to build the front and sides of 343. The historical cabinet built for this memorial will also honor and remember all Military Service Members and First Responders that have made the ultimate sacrifice in the South Carolina Midlands. 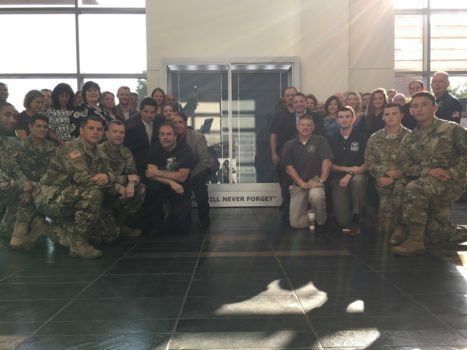 Poblocki Sign Company created a custom display cabinet with LED lighting for the Columbia Convention Center which will house steel artifacts from the World Trade Center that will tell the story of the Military Service Members, 1st Responders, and long relationship with New York City FDNY since 1867.